Just a few months after its debut, the Mercedes E-Class estate will be sold for £37,395 – just £2,000 more than its saloon sibling. Entry level version is the E220d SE which now has a new 2.0 litre turbodiesel engine producing 192 bhp and is mated to a nine speed automatic box. Owners should expect economy of around 67 mpg and emissions of 109g/km. While those are slightly worse figures than the saloon, they are still quite impressive for the size and weight of the vehicle. When put alongside the saloon, the Mercedes E-Class estate has a similar front and but the roof line extends further and the rear lights are rather different and wrap onto the wings from the tailgate. There’s no doubt that the long overhangs at each end create space and practicality to make the E-Class estate one of the most practical choices in the premium estate class. Indeed, with a boot size of 1,820 litres, it is much larger than many of its main rivals but it is a tad smaller than the Skoda Superb, for instance. One big difference for the Mercedes E-Class estate is that later this year there will be an option for a third row of seats. 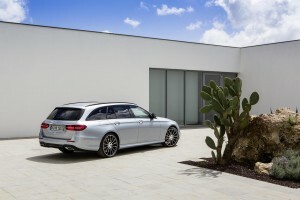 Another feature for the estate being launched later this year is a special film that reduces the road noise substantially and the film is applied to the windscreen and side windows. Among the new features for the E-Class estate are a hands-free tailgate and keyless-go and there’s also a load securing kit available as well as self-levelling air suspension. As potential owners will expect, the Mercedes E-Class estate comes with a premium interior and the cabin is well designed with lots of leather, metals and woods to create a comfortable, very quiet and refined environment. There’s also plenty of kit on board for the money with safety features including active brake assist and also a drive pilot system that enables the driver to follow at speeds of up to 130 mph the car in front safely. Among the options is remote parking pilot. 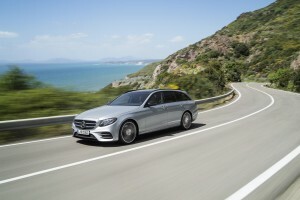 In the cabin, the estate and saloon versions are more or less identical with the top spec Mercedes E-Class estate coming with a 12.3-inch touchscreen that features digital dials. There’s also the same selection of engines available from launch and owners will find these will include the six cylinder E350d models and a new AMG E43 petrol unit. This entry was posted in Car Leasing, Cars, Family Car, New Cars and tagged Mercedes E-Class estate by Steve Lumley. Bookmark the permalink.